Irish is a main home, work or community language for approximately 2% of the population of the Republic of Ireland;  the population of the Republic of Ireland was shown as 4,761,865 in the 2016 census. 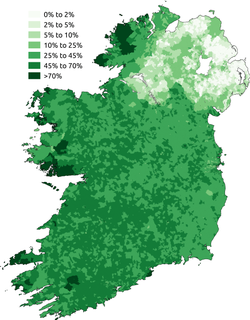 The 2011 census in Northern Ireland showed that Irish is the home language of 0.2% of people, with 6% of people able to speak Irish to varying degrees (see Irish language in Northern Ireland). One in four people (~1.7 million) on the island of Ireland claims to understand Irish to some extent. Estimates of fully native Irish language speakers range from 40,000 up to 80,000 people. Areas in which the language remains a vernacular are referred to as Gaeltacht areas. While the number of fluent urban speakers is rising (largely because of the growth of urban Irish-medium education), Irish in the Gaeltacht grows steadily weaker. The 2016 census showed that inhabitants of the officially designated Gaeltacht regions of Ireland numbered 96,090 people: down from 96,628 in the 2011 census. Of these, 66.3% claimed to speak Irish, down from 68.5% in 2011; and only 21.4% or 20,586 people said they spoke Irish daily outside the education system. It was estimated in 2007 that, outside the cities, about 17,000 people lived in strongly Irish-speaking communities, about 10,000 people lived in areas where there was substantial use of the language, and 17,000 people lived in "weak" Gaeltacht communities. In no part of the Gaeltacht was Irish the only language. Complete or functional monolingualism in Irish is now restricted to a relatively small number of children under school age. In 2010 the Irish government launched the 20-Year Strategy for the Irish Language 2010-2030 which is designed to strengthen the language in all areas and greatly increase the number of habitual speakers. This includes the encouragement of Irish-speaking districts in areas where Irish has been replaced by English. The 2015 independent report on the Gaeltacht commissioned by Údarás na Gaeltachta, however, does not regard this strategy as likely to be successful without a radical change in policy at national level. A more recent contributor to the decline of Irish in the Gaeltacht has been the immigration of English speakers and the return of native Irish speakers with English-speaking partners. The Planning and Development Act (2000) attempted to address the latter issue, with varied levels of success. It has been argued that government grants and infrastructure projects have encouraged the use of English:  "only about half Gaeltacht children learn Irish in the home... this is related to the high level of in-migration and return migration which has accompanied the economic restructuring of the Gaeltacht in recent decades". In a last-ditch effort to stop the demise of Irish-speaking in Connemara in Galway, planning controls have been introduced on the building of new homes in Irish-speaking areas. New housing in Gaeltacht areas must be allocated to English-speakers and Irish-speakers in the same ratio as the existing population of the area. It was reported on Nuacht RTÉ and Nuacht TG4 in November 2017 that most councils with Gaeltacht areas have not implemented this policy though since it came in. According to the 2016 Republic of Ireland census 73,803 people speak the Irish language daily in the Republic of Ireland outside the education system including 20,586 people who speak it every day in the Gaeltacht outside the education system. However, only 8,068 census 2016 forms were completed in Irish. Some Irish speakers have called for the census form to be provided solely in bilingual format every five years to make the Irish language version easier for Irish-speaking citizens to avail of. This is a List of Irish counties by the percentage of those professing some ability in the Irish language in the Republic of Ireland in the 2016 census. The census did not record Irish speakers living outside of the Republic of Ireland. Beyond the Gaeltacht, only English placenames were officially recognised (pre 2004). But further placenames orders have been passed to enable both the English and Irish placenames to be used. An example of present inconsistency is the village of Straffan, designated variously as An Srafáin, An Cluainíní and Teach Strafáin. In the 1830s John O'Donovan listed it as "Srufáin"  The nearby village of Kilteel was "Cill tSíle" for centuries, meaning "The church of Saint Síle", but since 2000 it has been shown as "Cill Chéile", which does not carry the same meaning. Most private companies in Ireland have no formal Irish language provision. Tesco Ireland and some SuperValu stores have some in-store Irish signage. Top Oil garages have some Irish language signage in their garages and O'Briens sandwich cafés have Irish language "Fáilte" ("Welcome") signs in their cafés. Bank of Ireland ATMs in many places have an Irish Language option and AIB ATM's display some Irish. Samsung phones have an Irish Language option and Meteor has also begun to offer an Irish language voicemail option to its customers. People corresponding with state bodies can send and receive correspondence in Irish or English although this provision is not complete in some semi-state companies yet. The ESB, Irish Rail/ Iarnród Éireann and Irish Water/Uisce Éireann have Irish-speaking customer support representatives and offer both Irish and English language options on their phone lines, along with written communication in both languages. These services are being phased in to all State organisations. The Emergency response number 112 or 999 also have agents who deal with emergency calls in both languages. Fuji Film have introduced an Irish language interface option to all Fuji Film kiosks around the world. Most public bodies have Irish language or bilingual names. An Post, the Republic's postal service, displays Irish place names outside their offices along with most of their internal signage with equal prominence in both Irish and English and continue to have their stamps issued in Irish and display place names in Irish on their postmarks as well as recognise addresses printed or written in Irish. Other examples of State bodies or companies with Irish names include Bus Éireann and Bord na Móna. Traditionally, the private sector has been less supportive. Tesco Ireland have announced that their new main aisle signage will be bilingual when new shops of theirs open and when current monolingual English language signage is getting replaced and they are also considering bringing in an Irish language option on their self-service checkouts. Top Oil garages have Irish language signage in their garages and O'Briens sandwich cafés have "Fáilte" ("Welcome") signs on their doors. In contrast, the "100% Irish" SuperValu on the other hand have no Irish signs in many of their stores as do not many Lidl, Aldi, Marks & Spencer and most international retailers in the Republic of Ireland and Northern Ireland and indeed even most Irish owned retailers or companies. In Galway the inaction of most businesses to incorporate the Irish language into their services e.g. on signage despite the county having a large Gaeltacht area led to the establishment of Gaillimh le Gaeilge ("Galway with Irish") in the city. They have had a lot of success in promoting the Irish language in the business and commercial sector in the city. There is now a Cill Dara le Gaeilge organisation in Kildare and Gnó Mhaigh Eo in Mayo working with the business sectors in those counties also and it is envisaged that there will be many other such organisations set up in other Irish counties. In 2016 it was announced that Galway City, Dingle and Letterkenny would be the first recognised Bailte Seirbhísí Gaeltachta (Gaeltacht Service Towns) under the Gaeltacht Act 2012 subject to them adopting and implementing approved language plans. It is expected that more areas will be designated as formal Bailte Seirbhísí Gaeltachta in the future. In 2018 it was announced that five areas outside the Gaeltacht on the island of Ireland are going to be formally recognised as the first Líonraí Gaeilge (Irish Language Networks) under the Gaeltacht Act 2012. The areas are Belfast, Loughrea, Carn Tóchair, Ennis and Clondalkin. Foras na Gaeilge have also said that they hope to award the status of Líonraí Gaeilge on other areas in the future. Thanks in large part to Gael-Taca and Gaillimh le Gaeilge a significant number of new residential areas are named in Irish today in a lot of counties in the Republic of Ireland. What may be surprising to many people is that these initiatives only really kicked off in a big way since the early 1990s when Galway City councillors passed a policy that all new residential areas in the Galway City Council area would be named solely in Irish. The initiatives spread to most other Irish counties during the Celtic Tiger 2000's property boom in Ireland in large part also thanks to the Gael-Taca free service to property developers to give them some optional choices of names in Irish for their developments. Over 500 new residential areas were named in Irish during the early-to-late 2000's property boom in Ireland. A lot of counties in Ireland have proportionally few solely Irish language named areas though including the capital Dublin and four counties in Northern Ireland have none. There have been few new residential areas built in Ireland outside the Greater Dublin Area since the Great Recession. The Irish-language television station TG4 offers a wide variety of programming, including dramas, rock and pop shows, a technology show, travel shows, documentaries and an award-winning soap opera called Ros na Rún, with around 160,000 viewers per week. TG4 provides their Irish speakers with information while also giving them the opportunity to voice their opinions to the public. In 2015 TG4 reported that overall it has an average share of 2% (650,000 daily viewers) of the national television market in the Republic of Ireland. This market share is up from about 1.5% in the late 1990s. The Ofcom 2014 annual report for Northern Ireland said that TG4 had an average share of 3% of the market in Northern Ireland. TG4 delivers 16 hours a day of television from an annual budget of €34.5 million. The Bible has been available in Irish since the 17th century through the Church of Ireland. In 1964 the first Roman Catholic version was produced at Maynooth under the supervision of Professor Pádraig Ó Fiannachta and was finally published in 1981. The Church of Ireland Book of Common Prayer of 2004 is available in an Irish-language version. In 2015 Minister for Education and Skills Jan O'Sullivan TD announced that there would be a comprehensive change in the instruction and teaching of Irish in Gaeltacht schools which would include an updated curriculum for students and more resources. In 2016 Taoiseach Enda Kenny launched the State 'Policy on Gaeltacht Education 2017-2022' which has come into operation on a phased basis since September 2017. The policy document is the first time the State and Department of Education have recognised the different linguistic needs of Gaeltacht primary and second-level L1 Irish-speaking students. The policy represents a fundamental change in education in the Gaeltacht, while also allowing current schools which teach through English in the regions to opt out of being classed as Gaeltacht schools. Since September 2017 new students in the majority of Gaeltacht schools are being taught a new Irish Junior Certificate subject tailored for L1 speakers of Irish. It is expected that a new Irish language Leaving Certificate subject directed at L1 speakers of Irish will come into the same schools in 2020. In 1972, outside the Irish-speaking areas, there were only 11 such schools at primary level and five at secondary level. Now there are 180 Gaelscoileanna at primary level and 31 Gaelcholáistí and 17 Aonaid Ghaeilge (Irish language units) at second level. These schools educate over 50,000 students and there is now at least one in each of the 32 traditional counties of Ireland. There are also over 4,000 children in Irish-medium preschools or Naíonraí outside the Gaeltacht. There are 47 Irish-language summer colleges. These supplement the formal curriculum, providing Irish language courses, and giving students the opportunity to be immersed in the language, usually for a period of three weeks. Some courses are college-based but generally make use of host families in Gaeltacht areas under the guidance of a bean an tí for second level students. Students attend classes, participate in sports, art, drama, music, go to céilithe and other summer camp activities through the medium of Irish. As with conventional schools, the Department of Education establishes the boundaries for class size and teacher qualifications. Over 25,000 second level students from all over Ireland attend Irish-language summer colleges in the Gaeltacht every Summer. Irish language summer colleges for second level students in the Gaeltacht are supported and represented at national level by CONCOS. There are also shorter courses for adults and third level students in a number of colleges. In recent years the design and implementation of compulsory Irish have been criticised with growing vigour for their ineffectiveness. In March 2007, the Minister for Education, Mary Hanafin, announced that more attention would be given to the spoken language, and that from 2012 the percentage of marks available in the Leaving Certificate Irish exam would increase from 25% to 40% for the oral component. This increased emphasis on the oral component of the Irish examinations is likely to change the way Irish is examined. Despite this, there is still a strong emphasis on the written word at the expense of the spoken, involving analysis of literature and poetry and the writing of lengthy essays and stories in Irish for the (L2) Leaving Certificate examination. In 2005 Enda Kenny, leader of Fine Gael, called for the language to be made an optional subject in the last two years of secondary school. Kenny, despite being a fluent speaker himself (and a teacher), stated that he believed that compulsory Irish has done the language more harm than good. The point was made again in April 2010 by Fine Gael's education spokesman Brian Hayes, who said that forcing students to learn Irish was not working, and was actually driving young people away from real engagement with the language. The question provoked a public debate, with some expressing resentment of what they saw as the coercion involved in compulsory Irish. According to the incoming Tánaiste Eamon Gilmore from the Labour Party in this book "Inside the Room" published in 2015 Enda Kenny tried to persuade him in the government formation negotiations in 2011 for Irish to become optional for the Leaving Certificate but he would not agree to it. No other main parties in Ireland are in favour of Irish becoming optional for the Leaving Certificate and it is questionable if Fine Gael will advocate in favour of the policy again in future manifestos if no other parties whom they may share power with in Government are also in favour of the policy. Fine Gael now places primary emphasis on improved teaching of Irish, with greater emphasis on oral fluency rather than on the rote learning that characterises the current system. In 2007 the Government abolished the requirement for barristers and solicitors to pass a written Irish language examination before becoming eligible to commence professional training in the Kings Inns or Blackhall Place. A Government spokesman said it was part of a move to abolish requirements which were no longer practical or realistic. The Bar Council and Law Society run compulsory oral Irish language workshops as part of their professional training courses. There are third level courses offered in Irish at all universities ( UCC, TCD, UCD, DCU, UL, NUIM, NUIG, UU, QUB). Many of these universities also have thriving Irish language departments, such as the NUI constituent universities, UL, UCC, DCU, UCD and TCD. The national Union of Students in Ireland has a full-time Irish language officer. Most universities in the Republic have Irish-language officers elected by the students. Attitudes towards the language in Northern Ireland have traditionally reflected the political differences between its two divided communities. The language has been regarded with suspicion by Unionists, who have associated it with the Roman Catholic-majority Republic, and more recently, with the Republican movement in Northern Ireland itself. Erection of public street signs in Irish were effectively banned under laws by the Parliament of Northern Ireland, which stated that only English could be used. Many republicans in Northern Ireland, including Sinn Féin President Gerry Adams, learned Irish while in prison, a development known as the Jailtacht. Although the language was taught in Catholic secondary schools (especially by the Christian Brothers), it was not taught at all in the controlled sector, which is mostly attended by Protestant pupils. Irish-medium schools, however, known as Gaelscoileanna, were founded in Belfast and Derry and the Gaelscoileanna movement has since expanded to across much of Northern Ireland similar to its expansion in the Republic of Ireland. An Irish-language newspaper called Lá (later called Lá Nua) produced by The Andersonstown News Group (later called Belfast Media Group) was also established in Belfast in 1984 and ran as a daily newspaper between 2003 and 2008. The paper is no longer produced due to a decision by Foras na Gaeilge to cease funding it in late 2008. BBC Radio Ulster began broadcasting a nightly half-hour programme in Irish in the early 1980s called Blas ("taste, accent") and BBC Northern Ireland also showed its first TV programme in the language in the early 1990s. BBC Northern Ireland now have an Irish Language Department in their headquarters in Belfast. The organisation Coláiste na nGael  plays a major part in fostering the Irish language in Britain. North America has several groups and organisations devoted to the language. Among these are Daltaí na Gaeilge and the North American Gaeltacht. In the Antipodes the main body is the Irish Language Association of Australia, based in Melbourne. The websites maintained by these groups are supplemented by a number of sites and blogs maintained by individuals. ^ a b Brian Ó Broin. "Schism fears for Gaeilgeoirí". Irishtimes.com. Retrieved 31 March 2015. ^ "Gach leabhar Gaeilge i gCló - Irish Books". Litriocht.com. Retrieved 31 March 2015. ^ "Language and Occupational Status: Linguistic Elitism in the Irish Labour Market". The Economic and Social Review. Ideas.repec.org. 2009. pp. 435–460. Retrieved 31 March 2015. ^ "Beo! - Meán Fómhair 2014". Beo.ie. Retrieved 31 March 2015. ^ "Nuashonrú ar an Staidéar Cuimsitheach Teangeolaíoch ar Úsáid na Gaeilge sa Ghaeltacht: 2006–2011" (PDF). udaras.ie. 2015. Retrieved 18 June 2015. ^ "Govt announces 20-year bilingual strategy - RTÉ News". RTÉ.ie. 19 December 2006. Retrieved 31 March 2015. ^ "Finding the muscle to fix our failing education system". Irishtimes.com. 25 January 2011. Retrieved 31 March 2015. ^ Éanna Ó Caollaí (22 March 2014). "Tesco puts the fada back into shopping". Irishtimes.com. Retrieved 31 March 2015. ^ "Get bilingual and get more notice for your local business". Advertiser.ie. 24 October 2013. Retrieved 31 March 2015. ^ "Northern Ireland - Irish Language - Blas". BBC.co.uk. 17 October 2014. Retrieved 31 March 2015. ^ Watson, Iarfhlaith (30 June 2016). "Irish-language broadcasting: history, ideology and identity". Media, Culture & Society. 24 (6): 739–757. doi: 10.1177/016344370202400601. ^ "nuacht.com". Nuacht.com. Retrieved 31 March 2015. ^ "Comhar Teoranta". Iriscomhar.com. Retrieved 31 March 2015. ^ a b "An Gael - Irisleabhar Idirnáisiúnta na Gaeilge". Angaelmagazine.com. Retrieved 31 March 2015. ^ "NÓS". nos.ie. Retrieved 26 November 2016. ^ "Gaelscoileanna – Irish Medium Education". Gaelscoileanna.ie. 22 February 1999. Retrieved 31 March 2015. ^ "Scoileanna : Gaelscoileanna – Irish Medium Education". Gaelscoileanna.ie. 2015. Retrieved 31 March 2015. ^ "Language and Occupational Status: Linguistic Elitism in the Irish Labour Market". The Economic and Social Review. Ideas.repec.org. 2009. p. 446. Retrieved 31 March 2015. ^ "The University Times | Head-to-Head: The Irish Language Debate". Universitytimes.ie. 21 February 2011. Retrieved 31 March 2015. ^ Donncha Ó hÉallaithe Donncha Ó hÉallaithe. "Beo! - Litir Oscailte Chuig Enda Kenny T.D". Beo.ie. Retrieved 31 March 2015. ^ "CELT: The online resource for Irish history, literature and politics". Ucc.ie. Retrieved 31 March 2015. ^ "Irish language in Britain and London". Colaiste-na-ngael.com. Retrieved 31 March 2015. ^ "Cumann Gaeilge na hAstráile". Gaeilgesanastrail.com. Retrieved 31 March 2015. ^ "Ireland Canada University Foundation". Icuf.ie. 17 October 2013. Retrieved 31 March 2015.